By Osama Al Sharif for Al-Monitor. Any opinions expressed are those of the author, and do not necessarily reflect the views of Iraq Business News. Jordan’s King Abdullah’s one-day visit to Baghdad on Jan. 14 was hailed as “historic” by Iraqi President Barham Saleh. It was the first trip to Iraq by the Jordanian monarch in more than a decade, and it came less than a month after the kingdom’s prime minister, Omar Razzaz, paid a visit on Dec. 28 to the Iraqi capital to sign a number of economic agreements. A royal court statement said the king noted the strong ties between the two countries, affirming that Jordan stands by Iraq as it seeks to safeguard its security and stability, and works to fulfill the aspirations of the Iraqi people toward further prosperity and progress. Until the US invasion in 2003, Iraq was Jordan’s main regional trading partner. Under former leader Saddam Hussein, Jordan was given a special status as it relied on cheap Iraqi oil. Iraq, on the other hand, became dependent on Jordan’s port of Aqaba for its essential imports as it suffered from UN sanctions imposed in 1990 following Iraq’s invasion of Kuwait, which were lifted in 2010. Last year’s figures show that exports to Iraq were only 5.8% of Jordan’s total exports. Before the closure of land borders in 2015, when Islamic State militants took over the main highway linking Baghdad to Amman in Anbar province, Jordan’s exports exceeded $1 billion annually. The borders were reopened in August 2017, but the Iraqi government put stern conditions on Jordanian goods going to Iraq. Following the US occupation of Iraq and the growing Iranian influence on that country, economic as well as political ties with Jordan weakened considerably. In November 2005, a number of Amman hotels were hit by suicide bombers who came from Iraq, killing more than 50 people and injuring more than 100. Pro-Iranian Iraqi politicians were critical of Jordan’s historic ties with Saddam and the fact that King Abdullah had given sanctuary to two of his daughters following the US invasion. Relations were especially tense under the premiership of Nouri al-Maliki, who is close to Iran, but improved under his successor, Haider al-Abadi. Maliki was critical of Jordan’s close ties to Anbar’s Sunni tribes, which Amman supported as they struggled to fight groups affiliated with the Islamic State. Following the general elections in Iraq last May, when Abdul Mahdi was elected prime minister and Saleh became president, bilateral ties saw a new start. On Nov. 15, Saleh paid an official visit to Amman as part of a regional tour. The visit was seen as a turning point in bilateral relations. King Abdullah’s arrival in Baghdad was praised by Jordanian commentators for ushering in a new phase in relations with Iraq. Jordan hopes that the king’s visit will put the final touches on a strategic project to build an oil pipeline from Basra to Aqaba. Also, the two sides had agreed last November to establish a joint industrial zone on the border between the two countries. Jordanian contractors hope that improving ties will allow them to take a share in Iraq’s multibillion-dollar reconstruction plans. Unlike the 1990s, however, when Iraq was entirely dependent on Jordan for its imports, the country is now openly doing business with its neighbors, such as Iran and Turkey, which pose serious competition to Jordanian businessmen. Politically, the royal visit comes at a time when Arab countries are taking steps to encourage Baghdad to distance itself from Iran. Political commentator Fahd al-Khitan wrote in Al-Ghad daily on Jan. 16 that the king’s visit underscores Jordan’s keenness on maintaining special ties with Baghdad under all circumstances — especially when Iraq was fighting a war against Islamic State terrorism. “Iraqis now realize that Jordan, unlike other countries in the region, has no interest in interfering in Iraqi affairs and that it stands with the Iraqi people and the Iraqi state,” Khitan wrote. Commenting on the economic benefits of the royal visit, editor of Al-Maqar website Salameh al-Darawi wrote on Jan. 14 that King Abdullah’s visit to Baghdad will reaffirm historic economic partnerships with Iraq, which is “the kingdom’s economic lung,” and will give the go-ahead for a number of strategic projects between the two countries. Darawi said that in the first 10 months of 2018, Jordanian exports to Iraq did not exceed $600 million, which is a modest figure compared to existing potential. But while Jordan pins high hopes on restoring strong economic ties with Iraq, some observers believe that the future of such relations will depend on Iran, which continues to wield deep influence over Iraqi politics. The king’s visit to Baghdad coincided with a trip to Iraq by Iranian Foreign Minister Mohammad Javad Zarif. In the past, a number of pro-Iran Iraqi politicians have made improving economic ties with Amman conditional to a thaw in Jordan-Iran relations, something that is unlikely to happen anytime soon. 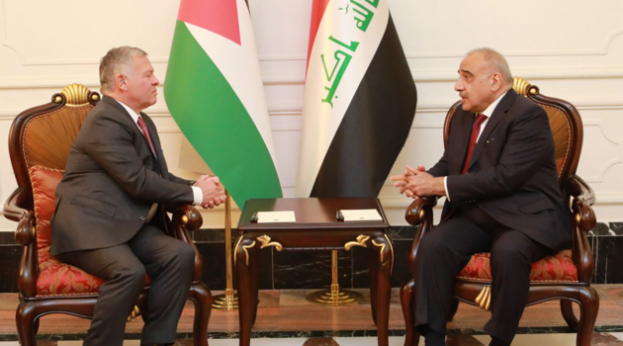 While Jordan pins high hopes on restoring strong economic ties with Iraq, some observers believe that the future of such relations will depend on Iran, which continues to wield deep influence over Iraqi politics.